There are probably so many chances for you to visit your friends or relatives’ home living and then take a look at their kitchen. Everybody must have his or her own necessities to be placed on the kitchen indeed. There are some utensils that are commonly owned like stoves or pans. However, for people who love cooking so much, other kitchen utensils like meat grinders and slicers must be there as well. If you think that meat slicers and grinders must only be owned by professional chefs or hamburger sellers, you wrong then. In fact, grinding the meat is an activity that can be done by everyone even if you may think you are not good enough in cooking. Interestingly, there are now various types of meat slicers and grinders you can find in the market. Many of them are produced or manufactured as good as possible so that the users will not find it difficult to use it. it is something nostalgic for sure to remember that some decades ago our parents still used their hands to grind the meat manually. There are many lacks to grind the meat like that. It is mainly related to the time and energy that are spent more. Based on that fact, having grinder and slicer to ease your cooking activities more is not something wrong. Here are then some matters you need to consider when choosing the meat grinder and slicer. Since the innovation and upgrades are always there, it is probably quite confusing to choose the most proper one. There are some kinds of grinders that can be run manually. It means you have to put some efforts to make it work. However, there is another type which is considered as more modern. It is the electric meat grinder. 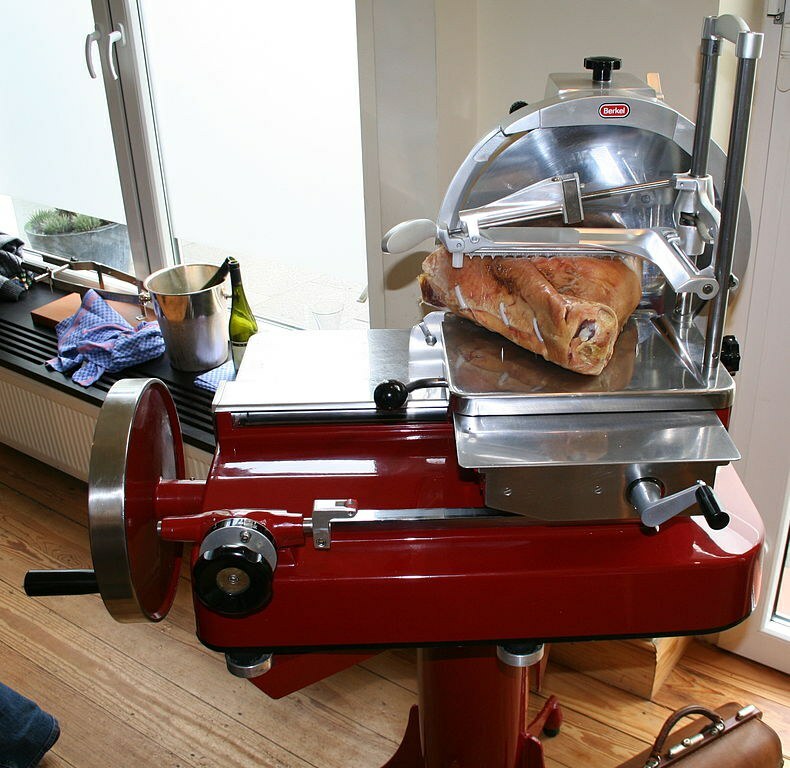 This grinder enables you to grind, chop, or slice more meat at once. It is very good for business or cooking for events. If you prefer something more practical, this grinder is more recommended for sure. Here are some matters to be considered when you need to buy an electric grinder. Power. The electric grinder is usually powered starting from 150 to 1000 watts but the most common ones are around 300 and 500 watts. The more meat to be processed means the more watts as well. Again, you must take a look at your necessities whether you really need to grind a large amount of meat at once or not. If it is not, it seems using the lower watts is not a problem. Blades. The best blades must be made of the stainless steel. More than that, the steel must also be the materials for plates. It is so that the grinding machine, in general, becomes more durable and long lasting. If you see there is a kind of grinder with a plate made from plastics, it seems you should not choose it. Switch. Make sure that the grinder has a reverse switch. Why? Reverse switch is considered as a very handy, comfortable, and easy to be used. Various Funnels for Sausage. It seems cooler if the grinder is able to produce sausage in different sizes. Not all grinders have such a benefit for sure. Therefore, it is a good thing if you choose this one. Warranty. A grinder is a kind of kitchen utensils that have many components. Of course, there is a possibility that one of the components can be broken accidentally. It is not something exaggerated then to make sure that the warranty is available there. The warranty probably does not cover all of the components. However, it should cover some parts particularly the machine. Here are things to consider when you need to buy meat slicers. Budget. The first important thing to do is actually estimating your own budgets. Besides, you must also acknowledge the necessities. You can ask yourself why you need the slicers whether it is only for household or professional needs. For the household needs, you don’t need such a big grinder that can load too much meat. It is surely a different story when you need the slicer to process the meat and then sell them. Sure, for this case, a slicer to load more is ultimately needed. The second thing to consider while choosing the slicer is regarding the function. Actually, it is more recommended for you to choose a machine that lets you do some activities at once, not only slicing but also chopping, and mixing. This kind of slicer must be more expensive but in the future, you can just save your money more. Brand. For safer way, you can choose the famous brands with many positive reviews. It is to lessen the possibility of the product is not satisfying enough later. Quality. The quality of machine must also be prioritized as well. It is about how long the slicer can be survived. Of course, you must want the grinder can be used for a long time, mustn’t you? It is no matter then to spend some more money if the product you find is really satisfying. There is a fact that the slicing machine is not strong enough to slice or chop certain types of meat. If it is possible for you to avoid buying such a slicer, you must do so. It is not bad to ask questions or look for the best slicer around whether it is in term of brand or type. Make sure that the machine is able to slice or chop many kinds of meat including some parts like muscle, gristle or fat. It is even great if the soft bone is able to be cut off also. If you are doing so, the possibility of being disappointed can be reduced later. Specs. The specs are the next things to be thought. It includes the power used by the machine to work including how much the watts, voltage, and so forth. The category of meat to be sliced must be specific as well whether it is light, medium, or heavy duty. Lastly, you need to know how to use the slicer properly. Even if the machine is really good and qualified, it can be damaged if you don’t use it according to the instructions allowed.